In this chapter the authors consider a cognitive cellular network that allows secondary (cognitive) users to access the bandwidth that is left over by the primary users. Furthermore, the authors allow multiple traffic classes in the system. The analysis of such a network is complicated by the fact that the secondary users face a randomly changing available capacity to serve their demands. The authors start with the multi-class Call Admission Control (CAC) model for existing Primary Radio Network (PRN). Then the authors propose a multi-class CAC model for Cognitive Radio Network (CRN) with different call blocking and call dropping thresholds for different class of services. The authors build up their analytical models for PRN and CRN based on Markov chain. The PRN works as if there is no interference from CRN. But the CRN needs to sense the status of PRN and to utilize the unused channels left by PRN. So the CRN is dependent on the PRN traffic load. The authors use a multi- dimensional Markov chain to model the CRN status under the condition of certain channels unused by the PRN. The authors can get the stationary distributions over all possible states of PRN and CRN. The Quality of Service (QoS) performance parameters for CRN, such as blocking probability, call dropping probability, and channel utilization can be derived from the obtained stationary distributions. Using it, the authors calculate the QoS performance parameters for multi-service cognitive radio network. Currently, Mobile Cellular Networks (MCNs) are using fixed/licensed spectrum bands. Most of the allocated spectrum bands are observed to be underutilized. All these existing radio networks are called primary radio networks (PRNs). The users that have exclusive license to use certain spectrum bands in PRNs are the primary users (PUs). The (temporarily) unused spectrum bands in PRNs are called “spectrum holes.” Cognitive Radio Network (CRN) is a promising technology that can identify and exploit the spectrum holes. 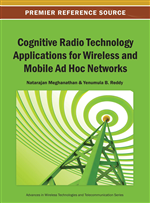 Cognitive Radio Networks are designed to work with primary radio networks (PRNs). The users in CRNs using the spectrum holes left by PRNs are the secondary users (SUs).